This is the first pair of adult slipper/boots off the needle, just waiting for some buttons. 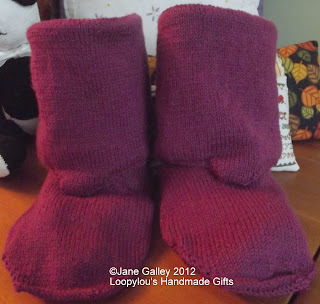 These turned out a lot larger than they were looking during the knitting process. With the wide legs, these will be perfect for winter nights, fitting over jeans and trousers. Lovely colour. Those will be so very comfy and warm. These look like they would keep your feet nice and toasty warm. I love the color. They are perfect for this cold weather.